I recently saw a meme that said, "I love you like Kanye loves Kanye!" At first glance, I was beyond tickled. There is no doubt in anyone's mind that Kanye West loves himself. His obsession with himself shows in everything he does. Considering we are in the season of love, I think we could all learn from Mr. West's fervor for himself. 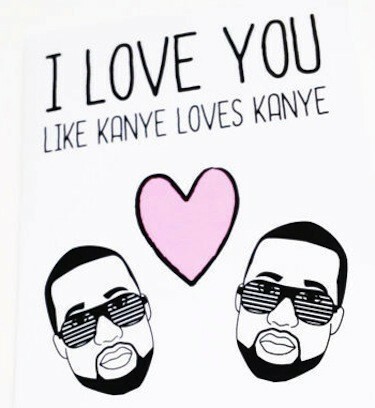 How would it look for your Valentine to love you like Kanye loves Kanye? They speak well of you in your presence and absence. Kanye has been quoted comparing himself to the likes of Walt Disney, Steve Jobs, Barack Obama, and even Jesus. Its obvious that he thinks very highly of himself and you need a Valentine that is devoted to thinking highly of you too! You're their main focus. Nobody wants to be the side-piece on Valentine's Day, in fact, some have dubbed Valentine's Day, Side-Piece Awareness Day. While Kanye loves Kim K, Baby North and Beyoncé, Kanye focuses on Kanye, the brand! They defend you. How could we ever forget Kanye's rant on "Sway in the Morning", with the infamous line, "You ain't got the answers Sway!" Kanye defends Kanye! It would be nice if you had a "ride or die" Valentine to defend you and stick by you, no matter what. It's always good to have someone in your life that will speak well of you, prioritize you and defend you. Isn't that what love is about?